« The Service Dog Registration Process —Make Sure You’re Honest! My cat Molly was the definition of unconditional love. From the moment I plucked her from under a car at five weeks old on a damp cold October night to the moment she passed 19 years later I was blessed with her unconditional love through life’s good and bad times. 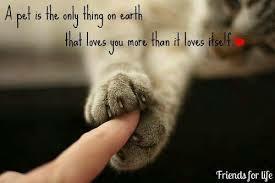 Unconditional love is something that our pets give us and it should be treasured. Humans are only capable of giving unconditional love to their children or pets. Indicated below is the Wikipedia definition of unconditional love and what a blessing that this truly is! Unconditional love is known as affection without any limitations, or love without conditions. This term is sometimes associated with other terms such as true altruism or complete love. Each area of expertise has a certain way of describing unconditional love, but most will agree that it is that type of love which has no bounds and is unchanging. It is a concept comparable to true love, a term which is generally used to describe love between lovers. Unconditional love is also used to describe love between family members, comrades in arms and between others in highly committed relationships. An example of this is a parent’s love for their child; no matter a test score, a life changing decision, an argument, or a strong belief, the amount of love that remains between this bond is seen as unchanging and unconditional. The greatest oldies of all time play on at Edgewater Gold Radio — the greatest variety of oldies play all the time.We play 50s 60s 70s 80s and great pop vocals! Download the free Edgewater Gold Radio app, listen to Edgewater Gold Radio at work from our webiste or from Live 365. Just click edgewatergoldradio.com. This entry was posted on Tuesday, July 10th, 2018 at 8:34 am	and is filed under Pet Supplies. You can follow any responses to this entry through the RSS 2.0 feed. Both comments and pings are currently closed.